Historically, barleywines, with their high alcohol, were brewed for their winter warmer quality. The huge grain bill, intense hops and long conditioning time make this beer perfect for savoring from a snifter next to a roaring fire. Cornelius De Boom figures prominently into the story of both 21st Amendment and its new beer. De Boom was a Belgian-born ship owner, who actually made it to San Francisco in time for the gold rush in 1848. De Boom Street, named for him, is the alley which runs alongside 21st Amendment Brewery. The brewery’s De Boom Street entrance is often referred to as “lower De Boom” by brewery employees, and the name is a fitting inspiration for the new brew. 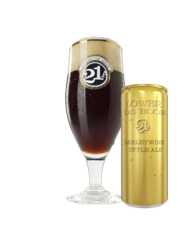 Lower De Boom is chestnut brown in the glass with complex notes of toffee malt, vanilla, burnt bread pudding and piney hops with a slight oak flavor. It is the latest installment in 21st Amendment Brewery’s Insurrection Series, a limited edition, once-in-awhile 4-pack release of a very special beer that rises up in revolt against common notions of what canned beer can be. It will be available in stores and on draft in bars February-March in all seventeen of 21st Amendment’s distribution territories, including CA, OR, WA, AK, ID, MN, OH, MA, NY, NJ, DC, MD, DE, PA, VA, GA and NC. For up to date availability, events and promotions, visit 21A’s website at http://www.21st-Amendment.com. Hey, we’re Nico & Shaun. We live for great beer. When we opened the 21st Amendment Brewpub in San Francisco in 2000, we vowed to do things differently. To us, the 21st Amendment means much more than just an end to Prohibition. It means the right to brew beer, the freedom to be innovative, and the obligation to have fun.